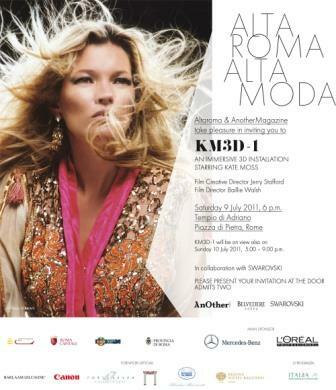 In one of the most classical, elegant, historycal and cool (also for the air con) Roman moneuments, Adrian's Temple, the AltaRoma fashion crowd had the opportunity to experience the 3D short film/fashion project, starring Kate Moss, and created by AnOther Magazine with the artist/filmaker Baillie Walsh. Went there by myself but soon met Romina Toscano and we experienced the film together. Waiting outside the black box where the 3D installation is placed, we were quite frighten by screams and loud noises that came from the soundtrack, just like an horror film. So we went in and watched the film arm in arm dreading for the moment of the screams. ;-) It was all fine though, as you will see form the video below. Sono andato per conto ma poi ho incontrato Romina Toscano e abbiamo visto il film insieme. Aspettando fuori dalla scatola nera in cui l'istallazione 3D era collocata, eravamo abbastanza spaventati dalle urla e irumori forti che provenivano dalla colonna sonora, proprio come un film dell'orrore. Cosi' siamo entrati e abbiamo visto il film sotto braccio apettando con terrore il momento delle urla. ;-) Alla fine è andato tutto bene, da come vedrete dal video. Retro and the (Brighton) city.